We offer Driver Training in and around the DFW surrounding areas since 2007. The following tuition schedule is in place for students enrolling in either our basic Driving School in Irving,Texas – 75063-4738 (Valley Ranch) location. We have individual and package deals for Irving Area only. We have contract deal (until you get your Driving Licence) available. The price may change if you are outside Irving Area. You will be pleasantly suprised at how affordable our Expert Driving Training are! You will feel more comfortable as our Driving Instructors ara Experienced, Professional and Approved. 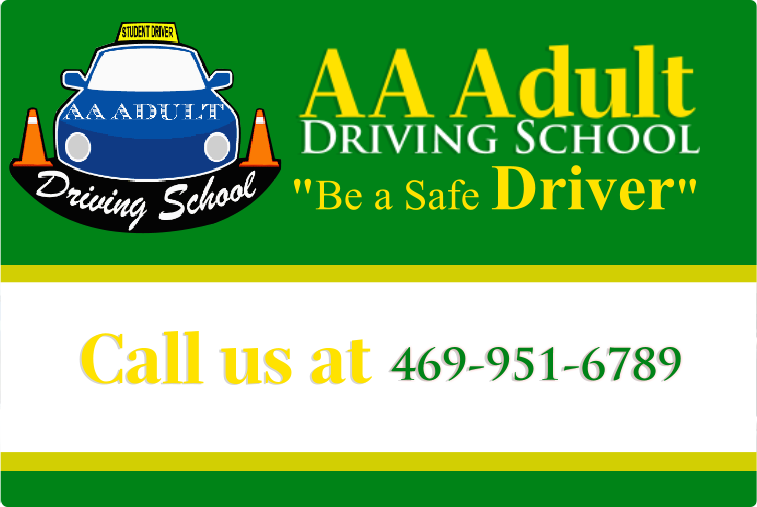 If you already know how to drive and still don’t feel quite prepared for the road test at the DPS, this 1 lesson course from our AA Adult Driving School is a good choice for you! The instructor will focus the lessons on what is expected when you attempt the Road Test, take you there, and allow you to use the school’s car for the test. Whether you are a driver with LIMITED driving experience, or a brand new driver and have the ability to practice between lessons, this may be the AA Adult driving lesson package for you!Our Irving Texas licensed, in-car instructors teach students of 17 years old with permit the techniques and defensive driving strategies needed in order to handle today’s highway conditions.You will practice controlling the car, steering, parking, proper use of mirrors, and more. This course consists of 3 individualized behind the wheel driving lessons. Ask about upgrading to 10-hours. If you have NO supervised practice, and lack someone to practice with, or have limited time to practice between lessons,this course is designed to help you. The Irving, Texas licensed instructor from AA Adult Driving School will evaluate your skills, and build on what you know. This course includes highway driving practice, road test preparation and many more.If you’re looking for comprehensive driver’s training, then this course of 5 individualized lessons is for you! PS. Additional $30 rent a car is required for Road Test in all packages. *NOTE* – Clock hour-55 minutes of instruction time in a 60-minute period for a driver education course. If you have NO supervised practice, and lack someone to practice with, or have limited time to practice between lessons,this course is designed to help you. The Irving, Texas licensed instructor from AA Adult Driving School will evaluate your skills, and build on what you know. This course includes highway driving practice, road test preparation and many more. * Above Individual and Package deals are for Irving Area Only. Rates may vary for other cities. If you’re looking for comprehensive driver’s training, then this course of 6 individualized lessons is for you! we have contract prices available until you get the license. If you need Driver Training (or) online course please call us at 469-951-6789 and we will be happy too discuss your need and get you on the road.